Parliament Street construction has dragged for several months, as the city replaces streetcar tracks from King northward to Dundas. This reconstruction has caused considerable disruption for cyclists, motorists and pedestrians. financial hardship for local businesses, whose customers and suppliers rely on Parliament St for access. 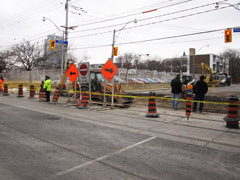 Yet Councillor McConnell’s publicly-funded Fall 2010 “newsletter” didn’t provide any news about this project; neither does her website. Not sure why it’s not worth a mention by Pam: it’s a $4.75-million project and impacts the busiest streetcar routes in the city: King (54,000 passengers daily) and Queen (43,000 passengers). It takes some digging to find some details on the city‘s and the TTC‘s websites. This work continues to drag on. 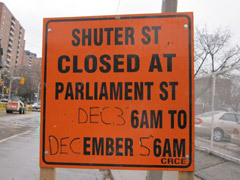 To reduce inconvenience to cyclists and vehicles, work could have been planned to minimize the duration of road closures – by reconstructing both the north and southbound lanes of the Shuter St. intersection at the same time, as implied by the sign (see above photo), but no. This intersection was closed Dec 3-4, and surprise: another closure of the same intersection, this time without notice, on Dec 10.